Want to get started on Android app development? If you want to start developing for a mobile platform such as Android, you should, at least, be familiar with Object-Oriented programming languages. If you are, and you know Java, even better! Now, what do you need to start developing for Android? First, you must have JDK (Java Development Kit) installed. Then you have to download Eclipse. I recommend the Eclipse IDE For Java Developers. 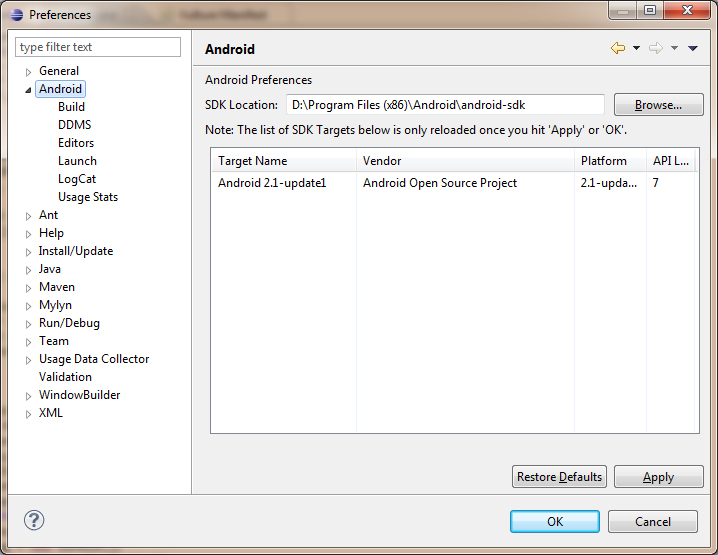 Once you have Eclipse installed, we need the SDK (Software Development Kit) for Android. You can grab it from here. Pick the right one based on your platform (I’m assuming Windows) and install it. Open Eclipse, hit the “Help” menu and click on “Install New Software” and a window like the one shown on the picture on the left will pop up. Type in the address: https://dl-ssl.google.com/android/eclipse/ and wait for it to load source and when it finishes you should have an item called “Developer Tools”. Check it, and click next. The following window will show you the tools to be downloaded, click Next and Accept the License Agreements. Click Finish and it’s done. It is recommended to restart Eclipse at this point. We have to configure the ADT Plugin to work properly. In Eclipse, go to Window ->Preferences; a new window will show up. Click on Android and on the SDK Location field, hit the Browse button and navigate to the folder where Android SDK was installed. Click Apply and you’re all set. As you know, there are several versions of Android. Depending on your target you should pick the right one. I’m developing for HTC Wildfire devices, they come with Android 2.1 from factory, so I’ve selected the Android SDK 2.1 package from the Window -> Android SDK and AVD Manager. Once you have selected your SDK, go ahead and get the HelloWorld app from here and follow the tutorial.